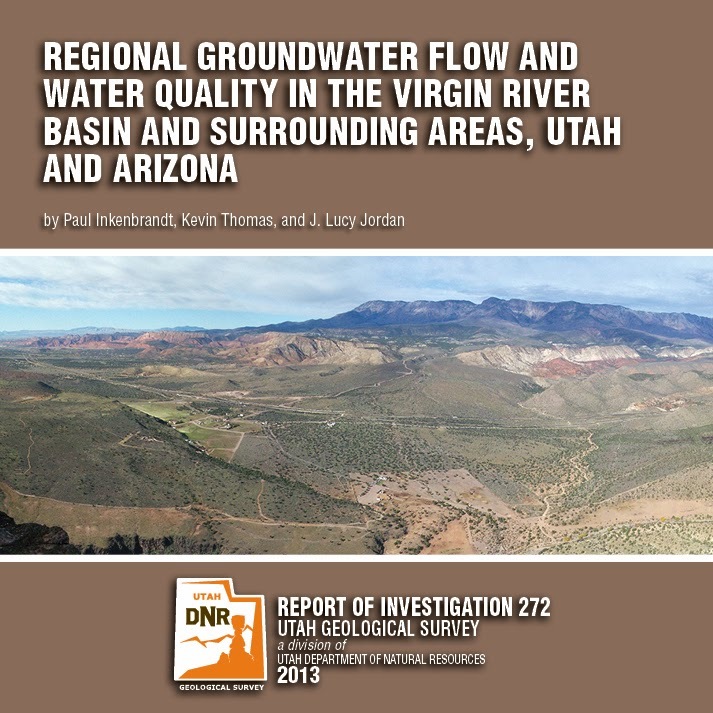 The Utah Geological Survey as released a new report on "Regional Groundwater Flow and Water Quality in The Virgin River Basin and Surrounding Areas, Utah and Surrounding Areas, Utah and Arizona." The announcement from UGS says, "In this 46-page report, we characterized the deep aquifer system and its connections to the overlying aquifers in the area of the Hurricane fault in Washington County by examining well logs, creating regional potentiometric-surface maps, compiling groundwater quality data, conducting gravity surveys, examining remote sensing data for surface lineaments, and determining areas for potential monitoring wells. Results of the study were: (1) R and C aquifer groundwater depths are > 500 feet in the I-15 corridor area, (2) a groundwater divide likely exists south of the Utah-Arizona state line, (3) groundwater flow follows open fracture systems, (4) fracture conductivity is highest near the fault, (5) dissolution of evaporites increase groundwater TDS, and (6) a well should be drilled into the Hurricane fault near Pintura." watch tar creek on netflix. .